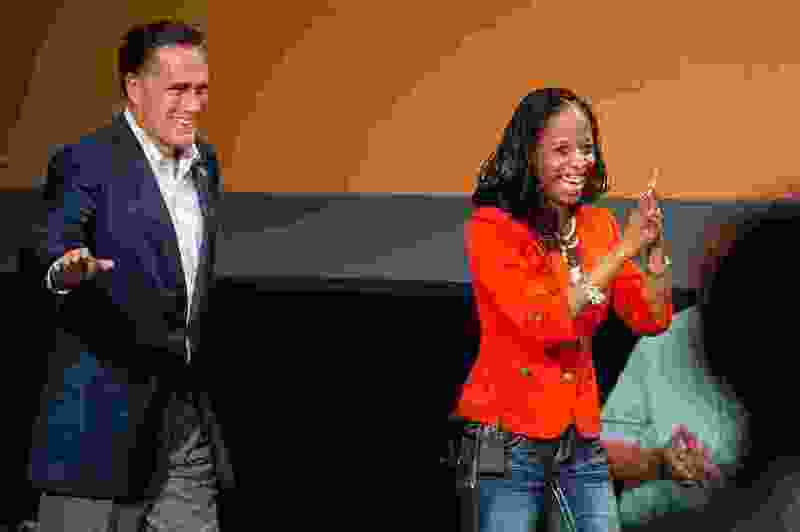 Trent Nelson | The Salt Lake Tribune Mitt Romney speaks at a rally to support Mia Love, who is running as a Republican in Utah's 4th Congressional District. Wednesday October 8, 2014 at Thanksgiving Point. Washington • The Republican charged with keeping GOP control of the House, Rep. Steve Stivers, said Thursday that Mitt Romney’s Senate bid will help boost Rep. Mia Love’s re-election chances, though Stivers acknowledged that Democrat Ben McAdams is a tough challenger. Love, seeking a third term in the House, likely will face McAdams in the general election this fall, and Republicans like Stivers say that Romney leading the ticket could recruit more Republican votes. Romney, a former Massachusetts governor and 2012 GOP presidential nominee who now lives in Utah, faces a June primary against Rep. Michael Kennedy, R-Alpine. Romney’s primary also gives Love an edge, Stivers says, because she can help register more Utahns to vote as Republicans. But McAdams’ campaign says Romney may not be the golden ticket for a Love victory. McAdams won his Salt Lake County mayoral seat with 54 percent of the vote when Romney topped the 2012 ticket as the Republican presidential candidate. Romney garnered 60 percent of Salt Lake County’s vote that year. A polling memo that the Mellman Group, a Democratic political firm, conducted for the McAdams campaign noted that there was no difference in voters’ attitudes toward McAdams, whether they supported Romney or not. About 46 percent viewed McAdams favorably, while 14 percent were unfavorable between voters who backed Romney and those who didn’t. Stivers also said he believes President Donald Trump will be helpful for GOP candidates nationwide because he can bring out the conservative base on Election Day. “The president can help us in every seat in the country, and you’ve all seen his approval ratings,” Stivers told the Regional Reporters Association on Thursday. While some voters don’t like the president, Stivers added, there’s a correlating number of those who do. “We know how to use him to motivate our voters,” Stivers said. Roberts, citing numbers from the political handicapping website FiveThirtyEight, said Love has backed Trump’s position with nearly all her votes since he took office.